First Words is available for free for all Grid 3 and Grid for iPad users. First Words is a fun and interactive learning tool included with our Grid software packages. The grid set provides an exciting, engaging and educational resource for children at the beginning of their communication journey. Amigo, an animated robot, is on hand to help users learn and speak their first words. Each motivating collection of no-fail activities helps children progress towards using augmentative and alternative communication (AAC). First Words leads the way for using symbols in communication, encouraging play and exploration with language. 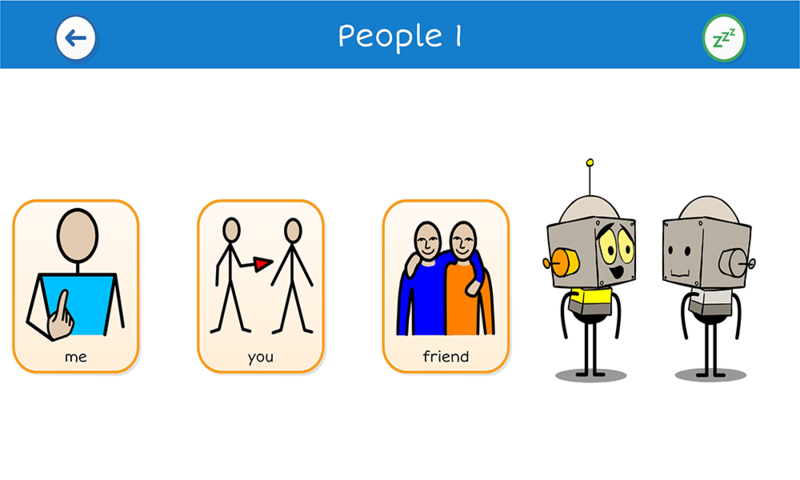 Amigo the robot is a friendly animated character who is on hand to help users learn and speak their first words. Built on many years’ experience, the resource has been developed in partnership with Speech and Language Therapist, Andrea McGuinness. The grid set incorporates key language acquisition techniques, such as modelling, in completely new ways that can be used at home and school. Everyone can support an individual using First Words and have fun along the way. We believe non-verbal children need to be given every opportunity to learn and speak the same first words a verbal child would. The words and phrases used in First Words were chosen from pragmatic user research that identified the most commonly first spoken words used by children. This belief, in combination with working with people at the very start of their communication journey, has taught us that activities need to be engaging and motivating to aid progression towards communication. First Words provides an essential but refreshing collection of activities for this crucial early stage of learning language. First Words is a tool designed to introduce the basic principles underpinning AAC. Every activity is error-free, with vocabulary specifically chosen to reflect the first words typically learnt by verbal children. The vocabulary also includes words that will empower children when they begin using an AAC system, for example, ‘more’ and ‘stop’. 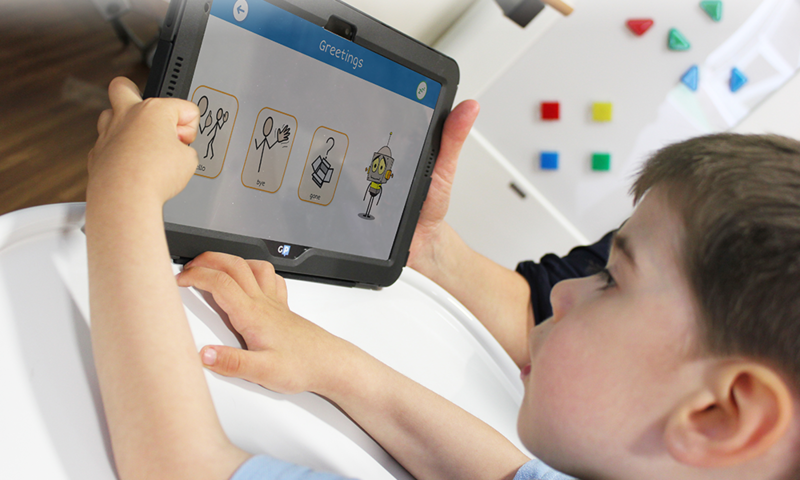 During each activity children using First Words will be assisted by Amigo, the friendly robot. Each word is displayed, with a supporting symbol. The child is then able to make a choice, prompting the words to be spoken aloud. Once the word is spoken Amigo springs into action – acting out the word, phrase or instruction. The six areas within the grid set provide a progressive range of activities that introduce very simple language concepts, such as ‘hello’ and ‘goodbye’, through to building two word sentences or exploring words that sound the same but have different meanings. These words are based on core vocabulary. They are easy to teach as they can be used across many different situations throughout the day, reinforcing learning through repetition. 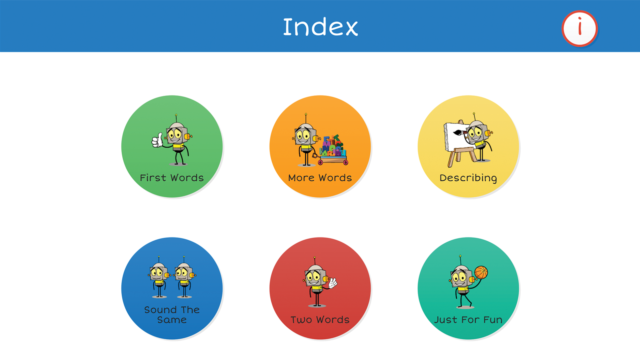 Building on the activities in ‘First Words’, the number of words per page increases whilst continuing to use core vocabulary with the addition of common nouns and actions. In this activity, the animations look at attributes, descriptions, prepositions and feelings. Examples of the vocabulary used here include: ‘fast’, ‘slow’, ‘big’, ‘small’, ‘loud’, and ‘quiet’. When learning language, a fundamental concept is to learn that some words have more than one meaning (homonyms). The activities in this category aim to give students experience of multi-meaning words. These activities encourage students to put two words together and move on to the next step in language development. Phrases are built, left to right, on each page. For example, ‘Hi’ as a a greeting with the addition of ‘mum’ to address an individual. Students using this activity set may well be on the pathway to using AAC. These grid sets contain phrases and sentences to select. Watch as Amigo carries out the action! First Words is a resource that is useful to any child showing signs that they are ready to move on from early cause and effect activities, as well as those at the very early stages of communication and language development. Whether the focus is on learning symbols, experiencing text for the first time or constructing simple sentences, First Words helps children achieve their communication goals. 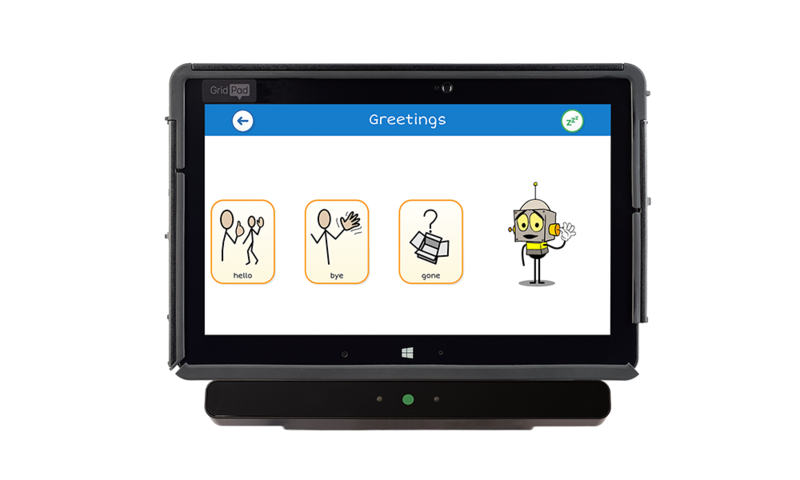 First Words is compatible with all access methods, from touch and switch to eye gaze and pointing devices. Every activity has a rest cell present in the corner, enabling a facilitator to pause access, giving them time to talk through the options and the child the time to familiarise themselves with the words before making a choice on the screen. “Modelling is central to how we learn to talk and communicate. If we didn’t see other people talking and saying words, we simply wouldn’t know how to do it ourselves. “Children grow up surrounded by people who are talking, saying words and providing clues about what those words mean. For example, to model the word “car” to a child we might hold up a toy car, or point to a real car, and say the word “car”. We might also model how that word can be used with other words, by saying “it’s a red car”, or “that car is fast”. Then, once children start to say words themselves, our responses confirm the meaning of what they have said. For example, if the child says “more” when we are blowing bubbles, we would respond by blowing more bubbles.